Over The Road, 25 Years In The Making! - Safety Dawg Inc.
Over The Road, 25 Years In The Making! Holy smokes, just reading this month's magazine. 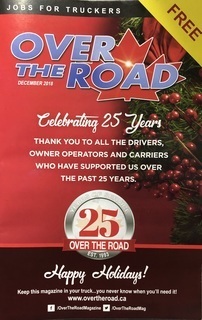 "Over the Road Magazine," 25 years they've been in business. I just want to say congrats to Peter Charboneau, and the whole Over the Road gang, and to his wife Mary, for letting Peter launch 25 years ago, "Over the Road Magazine." I've been privileged over these 25 years, to be both a customer ... 25 years ago, I was working for TNT, and purchasing ads in the magazine, soon after it launched. For many, many years, we ran a monthly ad in the magazine. So, I was a customer. Then, later on when I left TNT, I was able to contribute monthly articles to "Over the Road Magazine." What a great privilege that is, to be a part of something that has been around for 25 years, and shows no sign of letting up. Peter, and the Over the Road group, keep expanding your offerings, which was just wonderful. Anyways, I just wanted to say, "Congrats," and I wanted to highlight the fact that "Over the Road Magazine" has been around for 25 years now. If you need to advertise, if you need to recruit and look for drivers, I think that's the place to go, "Over the Road Magazine." All right. Congrats Peter. Congrats Mary, and the whole Over the Road gang. Safety Dawg's out. Drowsy Driving: What are the Risks and How do you Prevent It? CVOR Level 2, What Is It Trying To Tell Me? Will Your Driver Files Pass An Audit? You need your drivers files up-to-date and complaint. The post Disc Brakes, Management Best Practice appeared first on Safety Dawg Inc..